Want to join me in making a difference? We're raising money for Rady Children's Hospital and Health Center, and any donation will help make an impact. Thanks in advance for your contribution to this great cause! It is the only hospital in the San Diego area dedicated exclusively to pediatric healthcare and the region’s only designated pediatric trauma center. In affiliation with the University of California, San Diego School of Medicine, they are the region’s teaching hospital for the next generation of pediatric physicians. It is a major pediatric clinical research center, working in collaboration with world-renowned institutions, including UC San Diego and St. Jude Children’s Research Hospital. Join us on Mar. 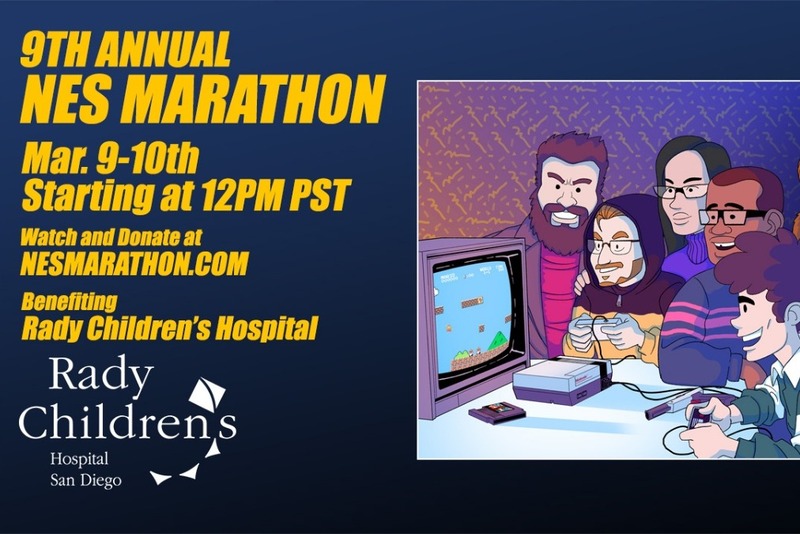 9-10 as we play some NES games and raise money for this great cause! Watch on Twitch at Twitch.tv/ContriCode. I'll be joined by Ian, his wife Vani, Super Beard Bros. Alex Faciane and Jirard Khalil, as well as Andre Meadows from Black Nerd Comedy! This year, we're changing it up and going to have programming blocks, but you can still donate and choose what we play! If you'd like to choose what we play, please donate at least $100 and leave a comment with the game of your choice! During one of our viewers' choice time blocks, we'll fire up your game and play it! We'll also have a good ol' spinning game wheel that we'll spin at every $500 reached! We'll have some nice random choices like the chat choosing an NES game, maybe a hot sauce challenge, and more! If you'd like to be Charity Sponsor for the event, please donate at least $300 before the event and email NESMarathon@thepunkeffect.com with your promotional image as well as short ad copy about your business. You'll be able to promote your website/business/cause with your logo emblazoned on screen during the event as well as having us talk about you with your Famous Live Reads. Donations are 100% tax-deductible in the US! Please spread the word for this good cause!